Passengers are crowded during rush hour at Guomao Station of Beijing, China’s subway. In an effort to mitigate congestion, poor quality of service, and costly subsidies, Beijing’s municipal government has proposed a subway fare increase. Photo by Jens Schott Knudsen/Flickr. Beijing’s subway system – one of the longest in the world at 469 kilometers (289 miles) of track – is confronted by excessive congestion and costly government subsidies. In an extremely controversial move, the city government has decided to increase the standard subway fare, currently fixed at 2 Yuan (USD $0.33) per trip. If the proposal survives an upcoming public hearing, Beijing will join the ranks of cities like São Paulo, Brazil and Mexico City, Mexico in raising fares for public transport.  Why would the city have to raise subway fares?  Will the fare raise be sufficient enough to salvage the poorly-operated and financially distressed subway system? This blog post will address the first of these questions, arguing that the fare increase is justified on the grounds of social benefits, equity, and financial viability. And stay tuned for a follow-up piece on TheCityFix that will delve into the second question. Beijing has experienced a subway boom in the last decade: the system’s length has dramatically increased from 54 kilometers (34 miles) and just two lines in 2001 to 465 kilometers (289 miles) and 17 lines in 2013, moving over 10 million riders every weekday. 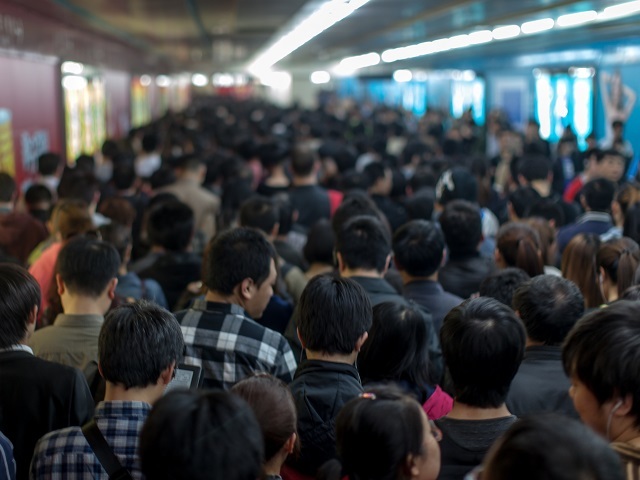 But the sheer size of Beijing’s subway does not guarantee its reliability – over-crowding and frequent service disruptions challenge both its quality of service and comfort. Partly due to low subway fare, on some lines, peak-time passenger flows have exceeded their capacity by 144%, almost comparable to 171% in Tokyo, Japan – the world’s most congested subway system. Moreover, since Beijing’s subway constantly runs at its maximum capacity, safety and security concerns are widespread. For example, the system’s busiest line, Line 10, breaks down almost every 20 days. Furthermore, the large public subsidy required to support the system strains the financial well-being of Beijing’s municipal government. The high annual operation cost of 600 million Yuan (over USD $99 million) combined with low passenger fares results in huge operation deficits. In 2012, the public transport subsidy reached a stunting 17.5 billion Yuan (USD $2.9 billion), a figure that is estimated to top over 18 billion Yuan (USD $3 billion) for 2013. The government’s goals behind raising Beijing’s subway fare are to improve the subway’s quality of service and relieve the city’s financial burden. Looking beyond these frequently-cited motivations, why else would the city need to raise its subway fares? Beijing is not a unique case of a low-fare subway system. The world’s cities generally fall on a spectrum between two camps when it comes to public transport fares. At one end of the spectrum there are cities like Beijing and Mexico City that rely heavily on government subsidies and charge little for people to use mass transport systems. These cities underscore the “public good” nature of public transport, where subsidies are justified not only on the grounds of public equity, but also due to social benefits – affordable public transport systems discourage private vehicle usage and reduce external costs from traffic congestion and air pollution, including greenhouse gas (GHG) emissions. At the other end of the spectrum there are cites like Hong Kong and Tokyo, which favor charging public transport passengers a higher rate, but run systems with nearly zero subsidies through diversified funding resources. Cities in this second group believe that a free market system is a more efficient, equitable way to run a subway. Public transport fare spectrum. Graph by EMBARQ. While the jury is still out to determine which of these approaches is most beneficial, many cities find a balancing point somewhere between the two ends of the spectrum. As a city situated at the far left end of spectrum, in the “public good” camp, Beijing’s exceptionally low fares and skyrocketing subsidies are not conducive to attaining public equity and social benefit goals it strives for. The social benefits that could have been gleaned from heavy government subsidies have been eroded by the Beijing subway’s poor quality of service. Its lack of comfort and reliability dissuade people from forgoing private cars and taxis in favor of riding the subway. In fact, the share of trips made by automobiles in the city has risen from 23% to 33% since the beginning of Beijing’s subway boom. 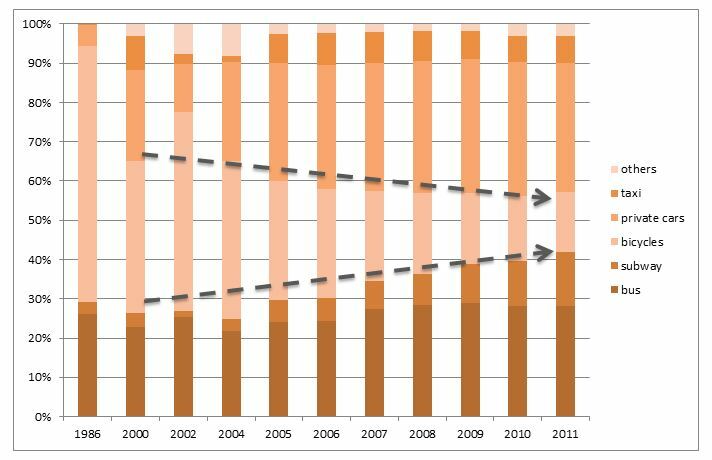 The subway ridership increase during the same period is partly attributable to the sharp decline in the number of people who cycle – down from 50% in 2002 to 15% in 2011. Beijing’s modal share changes: 1986-2011. Graphic by EMBARQ. Beijing’s low subway fare is not as pro-poor as commonly believed, either. In reality, the low fares create a tax burden on all levels of society in order to fill operation deficits. Further, considering that the bulk of the peak-hour riders are middle-class workers, the current fare structure subsidizes their expenses unnecessarily, depleting public spending that could otherwise go towards healthcare, pensions, or education. With Beijing’s standard subway fare currently too low to reap the equity and social benefits it is intended to generate, a reasonable fare increase that would strike the balance between the public good and free market approaches to public transport fares is justified. Despite the painstaking process to overcome strong public objection, a modest fare raise is an appropriate step towards improving the quality of urban transport in Beijing. Stay tuned for an upcoming blog that will examine the second issue raised in this post – will a fare raise be enough to improve the subway’s quality of service and mitigate costly subsidies?